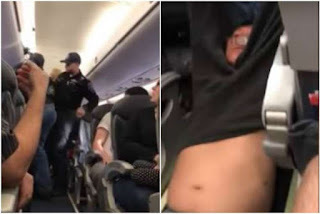 United Airlines was caught in a social media firestorm after a passenger on one of its overbooked flights was filmed being dragged from the plane. The airline needed to fly four of its staff to a connection and decided to bump off four passengers from Flight 3411, from Chicago to Louisville, Kentucky, to make space for the staff. The ugly incident on Sunday (April 9) has raised questions about airlines' overbooking practices and the lack of passenger rights. 1. Why do airlines overbook? Overbooking reportedly happens all the time. As empty seats cost airlines money, airlines offset the problem of passengers missing flights by overselling tickets. According to USA Today, federal regulations in the United States do not prevent carriers from selling more seats than a flight can accommodate. 2. What caused the latest episode? United Airlines, at the last minute, decided to fly four of its staff to Louisville. As Flight 3411 was full, it needed to bump off four passengers to make space for the staff. When overbooking arises, airlines usually offer an inducement to passengers to take a later flight. In United Airlines' case, they first offered US$400 (S$562), a hotel room for the night and a flight the following afternoon. The offer was later increased to US$800 but there were no takers. A manager then boarded the plane and told passengers that four people would be selected to leave. This selection is based on several factors, although a United spokesman told the BBC that frequent fliers and higher fare-paying passengers are given priority to remain on board. Carriers typically spell out the fact that they have the power to decide who gets "bumped" off a flight in the "contract of carriage" which customers are bound to when they buy their tickets. A couple who were selected agreed to leave the plane voluntarily. The wife of the man who was filmed being dragged off the plane was also chosen and agreed to leave. But her husband, who said he was a doctor and had to see patients the following morning, declined to leave the plane. The next flight did not leave until 3pm on Monday. Warning: This video contains vulgarity. It is not known if other passengers were approached to take his place. 5. Did United have the right to bump passengers? Yes. Passengers have few rights when flights are overbooked. But it is highly unusual for airlines to remove passengers to make way for staff at the last minute, Mr Charles Leocha, founder of passenger advocacy group Travelers United, told the BBC. Passengers are usually informed that they would be bumped off before they board a flight, not after they are already on the plane, he added. Videos on social media showed three security officers talking to the man, pulling him from his seat and dragging him along the aisle. The man's glasses were askew and there was blood on his face. United CEO Oscar Munoz, who issued a statement on the "upsetting event", apologised for having to "re-accommodate" the four passengers. The statement on United's Facebook page has since drawn over 64,000 comments, with the majority blasting the airline for its handling of the episode and vowing never to fly United again. 6. Which airlines bump passengers the most? Involuntarily bumping passengers is rare, The New York Times reported. In 2016, the 12 major US airlines posted a bumping rate of 0.62 per 10,000 passengers, the lowest annual rate since 1995, according to the US Transportation Department's statistics. The US airlines industry had just over 40,000 involuntary bumps out of nearly 660 million passengers last year. United's 2016 bumping rate of 0.46 - it involuntarily denied boarding to 3,765 people of its more than 86 million passengers - placed it fifth among the 12 airlines featured in the Transport Department's statistics. Hawaiian Airlines, Delta Airlines and Virgin America fared the best with bump rates of just 0.05, 0.1 and 0.12 respectively per 10,000 passengers. On the other end of the spectrum, Express Jet bumped the most passengers with a rate of 1.51, while Southwest Airlines was the second worst with 0.99.